Barry was great to work with! Karen Lloyd was very helpful and she is the greatest! I really enjoyed her kindness and willingness to continually check on me and my purchase and she will always be my best saleswoman yet! I worked with Karen she was diligent and she help all the way through the process. She even called and made sure I was still enjoying my purchase. Karen Lloyd is the greatest!!!! INFINITI of Birmingham in Hoover offers an impressive selection of new and used vehicles. Our staff makes the process of buying a new vehicle easy. Browse our complete inventory of vehicles and learn more about our various financing options. Schedule a test drive online or stop by our auto dealership in Hoover and talk to us in person. Our goal is to get you behind the wheel of your own vehicle! Irondale and Homewood INFINITI drivers will be glad to know that our experienced sales staff is eager to share its knowledge and enthusiasm with you and our certified technicians will take exceptional care of your vehicle. Helena, Chelsea and Pelham drivers, you can also request more information about a vehicle using our online form or by contacting us. 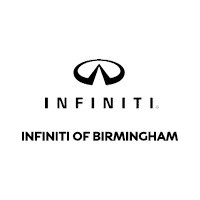 INFINITI of Birmingham in Hoover treats the needs of each individual customer with paramount concern. We know that you have high expectations, and as a luxury car dealer we enjoy the challenge of meeting and exceeding those standards each and every time. Allow us to demonstrate our commitment to excellence!